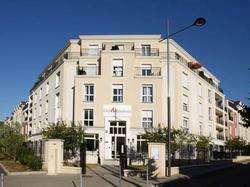 The City Résidence is located in Bry-sur-Marne town centre, 16 km east of Paris. It offers fully equipped apartments with satellite TV, a private bathroom and a kitchenette. Each apartment at the City Residence Marne-La-Vallée has a simple and contemporary décor. Some also have a private terrace with patio furniture. Guests have access to the garden and free Wi-Fi is available throughout the residence. Private parking is available on site. Disneyland Resort® Paris is a 30-minute drive from City Résidence Marne-La-Vallée. Bry-sur-Marne RER station provides direct access to the Arc de Triomphe in central Paris. 3Mn from the rer train station, 20mn from the Gare de Lyon, 25 mn from Orly and Roissy. Rer: line a - direction Noisy le Grand (Mont d'Est)/exit Bry sur Marne. If you plan to arrive outside these opening hours, please contact the hotel in advance to get the access code for your apartment. Bed linen and towels are provided on arrival. Apartments are cleaned and linen changed weekly. This apartment features a private garden, a kitchenette and a dining area. A washing machine and dishwasher are also provided for your convenience. One of the bedrooms in this apartment includes a private terrace or balcony. This apartment features a private garden, a kitchenette and a dining area. A washing machine and dishwasher are also provided for your convenience. The living room opens onto the garden and one of the bedrooms includes a private terrace or balcony. This apartment features a kitchenette and a dining area. This studio features a kitchenette and a dining area.